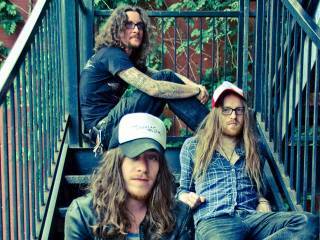 The Cadillac Three Ink Deal with Big Machine Label Group. Nashville based groupThe Cadillac Three (formerly The Cadillac Black) hit a career high note yesterday with the announcement of their new record deal with Big Machine Label Group. Jaren Johnston (guitar and lead vocals), Kelby Ray (bass steel guitar, dobro, acoustic and vocals) and Neil Mason (drums, percussion and vocals), are music city born and raised, and have a rock vibed country sound that fans are loving. Big Machine is home to some of the biggest in country like Reba McEntire, Tim McGraw, Taylor Swift, Rascal Flatts and Martina McBride. Congrats to the trio! Check in with Jaren Johnston from the trio when he stopped by a recent CMchat Google Hangout LIVE from Best of the West!